Five clusters of grapes and micro-bulb grape lights are a delicious combination in this burgundy light set. 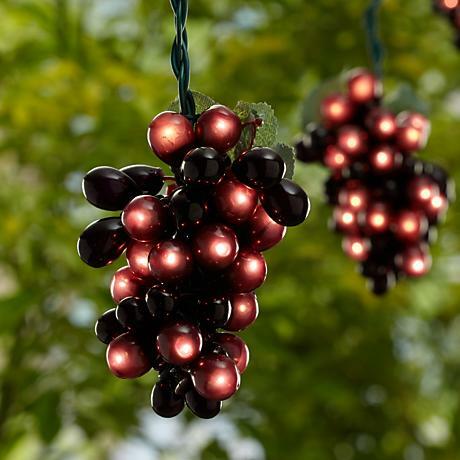 Your guests will be grapeful for a fabulous wine-tasting enhanced by this stunning five-cluster micro-bulb burgundy grapevine light set, or perhaps you'll want its luscious fruit and green leaves and a box of merlot all to yourself. Either way, each of the five mouth-watering portions on green wire contains ten cleverly concealed micro grape lights, for a total of one hundred lights. 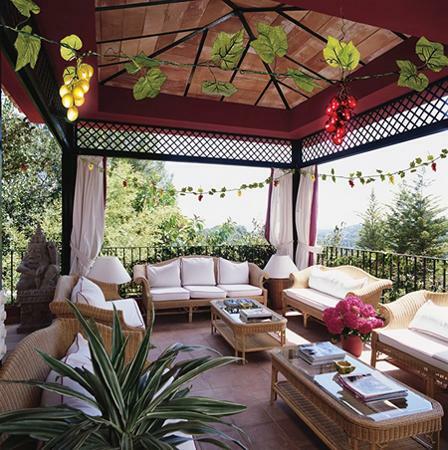 Each indoor-outdoor light set includes three replacement bulbs and two replacement fuses. • Realistic grapevine string light set. • Burgundy grapes and grape-lights, with green leaves. • One hundred clear 2.5V 0.02A 0.5 watt incandescent bulbs. • 3 spare bulbs and 2 replacement fuses included. • Safe for indoor and outdoor use.